Comfy beds, nice blankets. Quirky place! Amazing value for money on a private room, only $60 for a double. Loved the layout of the hostel being in a rainforest. Great stop off before and after Whitsundays! The best location in airlie! Right next to Woolworths and the lagoon. We had a double room and although it was small, it was clean and had good air con as well as our own mini fridge! The toilet and shower cubicles were also relatively clean, as was the kitchen. However the kitchen was definitely on the smaller side but it wasn’t that much of an issue. Airlie Beach is such a cute little town. The hostel is located in the heart of the Main Street 15-20 minutes from either marina. The staff is so nice and friendly and the accommodation is nice and open and clean. It’s next to a bar so the music will be playing till late. Lovely hostel right in the centre of Airlie Beach. Stayed in a 8 bed hostel room which was in its own little hut which was really nice. Room was clean and staff were super friendly. You can’t turn the air con off over night so it did get a bit cold. Kitchen wasn’t the cleanest but it was more to do with the other guests being messy rather than the hostel’s fault. Located in the center of Airlie Beach, 3-mins walk from the lagoon and the sea, good place to meet people, there is a bar just next to the camp with live music every night, so great atmosphere! You are sure to meet people that comes from the same country as you! The rooms are quite clean, sometimes the bathrooms are alright! 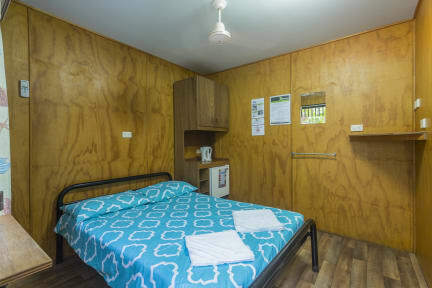 As there are many people staying in this hostel, the main kitchen can be quite crowded, so the thing is to cook earlier or use the 2nd kitchen at the back of the camp! Good base pre/post whitsundays. Really nice cabins. Kitchen not the best/cleanest but besides that a really good hostel!